It is officially summer now and I’m ready for beach days, more food festivals, summer day trips and of course summer foods or for me, summer desserts or snacks. What are you looking forward to this summer?? Is there a summer food you enjoy most at this time of year? Love to hear what you guys enjoy for the summer so please feel free to leave a comment below. As some of you know, I enjoy dairy free products because of my food sensitivities as I still learn and discover new foods that are dairy free as I always love to share them with my readers. I thought that I always share new vegan bakeries or restaurants that I also share with you new food products. Now that summer is finally here, I thought what better light fluffy summer food to enjoy than popcorn, right? I recently discovered a dairy free popcorn that is perfect for me that I didn’t know before until now called: SkinnyPop Popcorn. SkinnyPop Popcorn is a premium popcorn kernel that has no GMOs (genetically modified organism), no artificial ingredients, gluten free, dairy free, peanut free, no artificial flavours, zero trans fat, and preservative free. Their motto is using simple ingredients such as whole grain popcorn, natural sunflower oil and perfect amount of salt combine together to give you a “delicious snack that you can feel great about eating everyday” – SkinnyPop Popcorn website. SkinnyPop Popcorn comes in Popped Popcorn (already popped), Popcorn cakes and mini cakes and their new product is their microwave popcorn. SkinnyPop Popcorn also comes in different flavours from Sea Salt & Pepper to Naturally Sweet to Jalapeño to White Cheddar (Dairy Free). I recently picked up their Popped Popcorn in the original flavour and I thought it be great to add a healthy and summer twist to it the popcorn. After searching for ideas as I’m not much of a cook or baker, I thought of a simple and easy recipe that I would love to share with you. It’s an easy recipe for the summer and perfect for the upcoming Canada’s Day celebration to share with your family and friends. 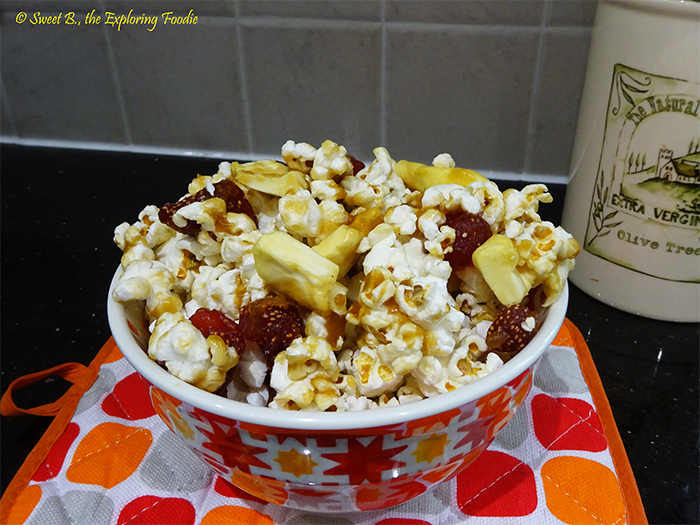 My new simple & easy recipe is called: Dairy Free Sweet Honey Popcorn with Dried Fruits. When you think of summer, you think of light and sweet so I thought with a healthy twist to put in dry fruits and with this recipe using dried strawberries and apples as strawberries are known for summer fruits. A great combination with strawberries are apples, but you can also substitute it with other dried fruits that you prefer or have just the dried strawberries on it’s own, which still works out perfectly. 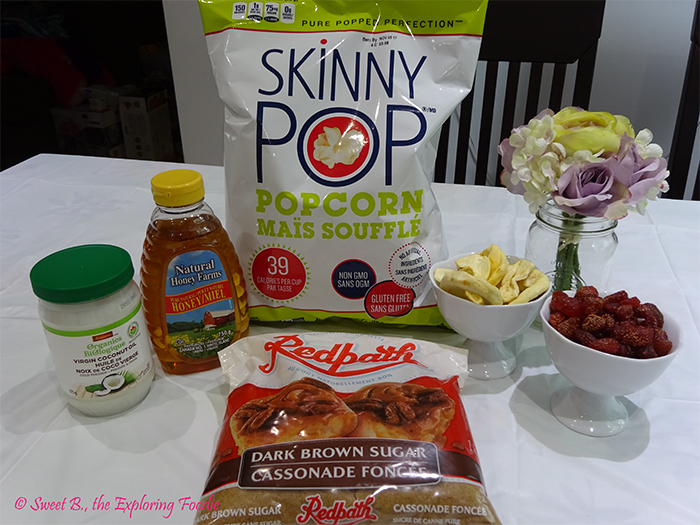 The ingredients for this recipe includes: SkinnyPop Popcorn, dried strawberries & apples, brown sugar, honey, and coconut oil. I’m using coconut oil in this recipe instead of butter as it’s the dairy free alternative to butter. An interesting tip is that I found out that coconut oil is tasteless so if you were worried about making the popcorn tasting like coconut, don’t be as it doesn’t from making this recipe myself. Once you have all your ingredients, have a large mixing bowl to put the popcorn, dried strawberries and apples ready to mix it with the honey sauce (mixture). 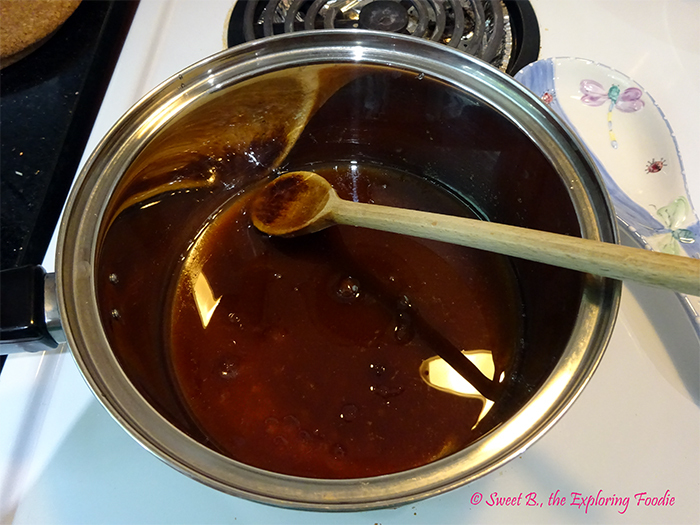 To make the honey sauce (mixture), in a medium pot or saucepan – add the brown sugar, coconut oil and honey. Cook it on medium high heat until the mixture is bubbling and well combined. Once it is done, pour the honey mixture over the popcorn & dried fruits in the large mixing bowl that you had prepared. You can pour as little or as much as you want in the bowl. Then mix until the popcorn and dried fruits are covered with the honey sauce (mixture). You can see below the photos of each step. So now you are ready to taste and enjoy this sweet and healthy vegan dairy free popcorn treat with a summer twist to it. Yum!! It’s the perfect sweet summer treat to share with your family and friends or a sweet bowl for yourself. Hope you give my new sweet, summer and healthy SkinnyPop Popcorn recipe a try and let me know what you think of it. Feel free to leave me your comments below as I would love to hear what you think of my recipe. 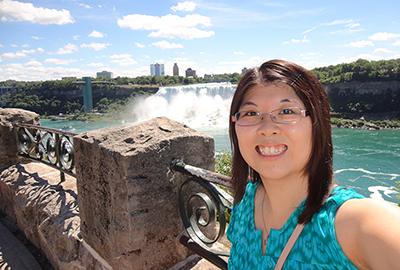 Don’t forget to stay connected with me on the latest updates on my next blog post or my foodie adventures, please follow me on Twitter @SweetBFoodie24 and Instagram @SweetBFoodie24. 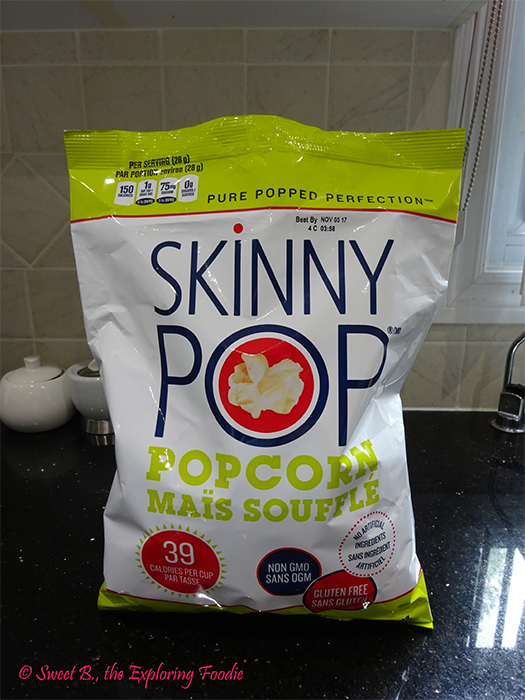 You can follow SkinnyPop Popcorn on Facebook @SkinnyPopPopcorn, Twitter @theskinnypop and Instagram @theskinnypop. A sweet honey popcorn with summer dried fruits perfect for the summer. 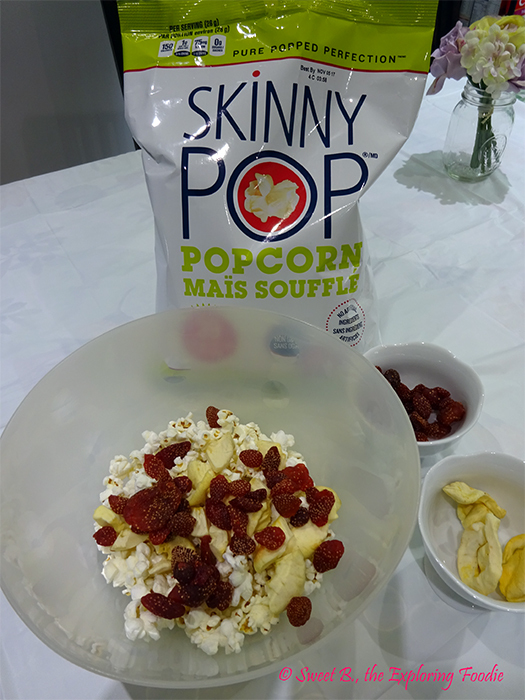 In a large mixing bowl, pour in the SkinnyPop popcorn, put in the dried strawberries and apples. In my case, I sliced the dried apples in smaller pieces as they were in rings to make it easier to eat. If you have other dried fruits, you can prepare them now. For the honey mixture – in a medium pot or saucepan, add the brown sugar, coconut oil and honey. Cook over medium high heat until mixture is bubbling and well combined by mixing it. Then pour honey mixture over the popcorn mixing bowl that you prepared before, you can pour in the amount desired or until all popcorn and dried fruits have been covered. In between pouring the honey mixture, use a wooden spoon or spoon to mix in between as it will get sticky to get an even coat of honey mixture with the popcorn. You can wait 5 – 10 mins before enjoying as letting the honey mixture soak in the popcorn before enjoy the sweetness.